For one thing, I wasn't getting much value from my copious amount of desk space. I used my work surfaces mostly to store stacks of papers and research materials I was saving and various office equipment and supplies. It was sometimes handy to have most of my stuff out where I could see it, but the chaos of this arrangement outweighed any real productivity benefits. With all of the stuff piled around on my desk space, I effectively had a small desk anyway! Here are some smart ways to maximize your minimal desk space. One of the big improvements I made to help me stay productive with little desk space is moving from analog to digital. In the old days, I had literally hundreds of pounds of paper documents in file cabinets and piled on my desk. I also had lots of notebooks with handwritten notes. The problem with analog stuff is that it takes a lot of effort to keep files organized and find the right material when you need it. I realized that my paper records were basically useless since I couldn't find anything and it wasn't worth the huge effort to organize the old papers. Now I keep all of my documents, research articles, and photos in digital form on my computer. I use paper documents only occasionally when I want to take notes while I am working on something. Then I scan in or type up my notes and then recycle the papers. I can search my digital files by keyword and date, and the digital files take up no room at all. If you store your data on the cloud, you can have access to all of your digital files from anywhere — home, work, or on the road. Are you really going to look at that stack of old magazines or papers again? Do you think you will ever use your zip drive again? At some point, it's time to just get rid of stuff you don't need and get your desk space back. I clear my desk at the end of every single day. When I had a large chaotic desk, this would have been unimaginable. In those days, I liked the idea of having papers, articles, and notes stacked around on my desk. I thought it gave the impression that I was busy and working on important things. Then one day, I had a meeting with a very successful colleague in his office. His desk was totally clear except for a couple of framed photos and the paper that we were meeting to discuss. He didn't feel the need to leave stacks of papers and things around to impress people. I could tell that he impressed people by focusing and getting things done. His highly organized desk impressed me, and I decided to make a change. Now I only get things out as I need them and put everything away at the end of the day. I keep my papers and other materials organized so I can easily find what I need when it is time to get materials out again to work on them. A small desk space seems a lot bigger when you keep it cleared. Even though my desk space is not very large, there is an equal amount of floor space under the desk. Most people underutilize this valuable storage space. It's actually a handy place to keep things close, yet out of the way. Use the forgotten under-the-desk space to get things off your desk so you can use all of your desk space productively as a work surface. During my recent office move, I sent a lot of equipment and materials out of my office to be stored somewhere else. I made a spreadsheet of all of the items that I moved out and noted where I stored them. Take a few minutes to label what's inside your storage boxes and label items with your name to make them easier to get back if you need them again. Store stuff that you rarely use away from your office to give yourself more desk space and boost your productivity. 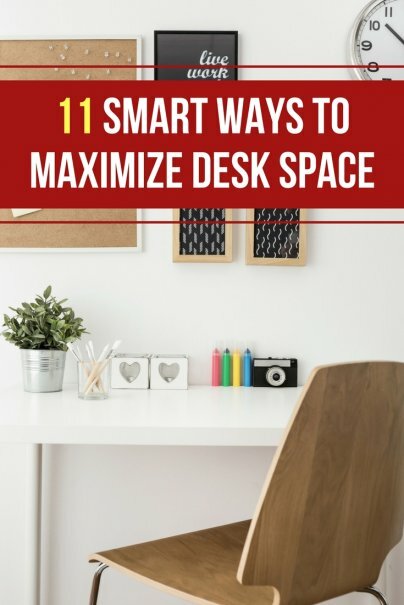 Use smaller equipment such as a laptop or tablet that you can easily move or put away to maximize availability of your desk space as a work surface. Get rid of equipment you don't need, such as a personal printer if there is an alternative you can use on the network. Arrange the items on your desk based on how much time you spend using them. For most people, the highest priority should be to arrange your chair and computer in the best possible location at your desk since this is where most of your time is spent. Next, find a convenient space for the phone and reserve some clear desk space to read papers and take notes while you are working. I set up a desk light over the space where I read papers, which makes reading easier and makes my office seem larger. Don't let out-of-control cables, power cords, and power supply bricks eat up your valuable desk space. Route cables behind equipment and under the desk to keep them off your desk space, and use cable ties to keep cables where you want them. You might even benefit by getting rid of some cords altogether — get an inexpensive cordless keyboard and mouse to get rid of a couple cords and gain some flexibility in how you can work at your desk. If you need to keep paper documents, thin them down to keep only the ones you really need. Then organize these important papers so you can easily find them later. Divide up your papers into piles by category, write the category names on file folders, and put them into a file cabinet instead of on your desk. Those papers that are cluttering up your desk should easily fit into only a few inches of file cabinet space in hanging files. Plastic food containers can store office supplies and miscellaneous hardware. Shoeboxes make great storage containers for larger office supplies and project materials. If you don't like using cardboard shoe boxes, you can get inexpensive clear plastic boxes so you can see what is inside. Group related materials together in storage containers to make kits that you can store in a drawer or under your desk and get out when you are working on a certain type of project on your desk surface. Set yourself up to take your computer and files with you and work productively away from your desk — at a coffee shop or in a conference room, for example. There are advantages to not being tied down to working at your desk. By being mobile, you can give yourself a bigger desk whenever you have a task that requires a lot of desk space, or if you just want to work at a big desk.